Rent DoubleTree by Hilton Pruneyard Plaza | Corporate Events | Wedding Locations, Event Spaces and Party Venues. Doubletree By Hilton Hotel Campbell - Pruneyard Plaza is a 3-star accommodation in the business center of Campbell providing guests with a patio, a sun terrace and barbeque grills. Built in 1990, the attractive hotel was renovated in 2012. Set in the prestigious Pruneyard Shopping Center in Campbell, CA, DoubleTree by Hilton Hotel Campbell - Pruneyard Plaza is a Mediterranean oasis in the heart of Silicon Valley. Enjoy easy access to shops and restaurants, plus modern hotel facilities and a warm, Californian welcome at our friendly hotel. You will be greeted with a signature DoubleTree chocolate chip cookie on arrival. Our relaxed Campbell hotel is close to many businesses and popular attractions, including the Santa Cruz Mountains, Santana Row, Levi's Stadium and bustling downtown San Jose. All of the stylish guest rooms at this hotel in Campbell, CA feature a variety of amenities, including a mini-refrigerator and a coffee maker. Stay connected with complimentary WiFi at the ergonomic desk, play music through the iPod dock or watch the 42-inch TV. Upgrade to a junior suite with a larger living area, whirlpool tub and a balcony overlooking the pool. Join us for breakfast and dinner daily at the newly launched PY Kitchen & Bar, and indulge in one of our signature cocktails. Work out in the 1,700 sq. ft. fitness center with the latest equipment and views of Pruneyard Shopping Center. Swim in the sparkling outdoor pool, explore the scenic jogging trail nearby or unwind by the fire pit on the outdoor patio area. With almost 5,000 sq. 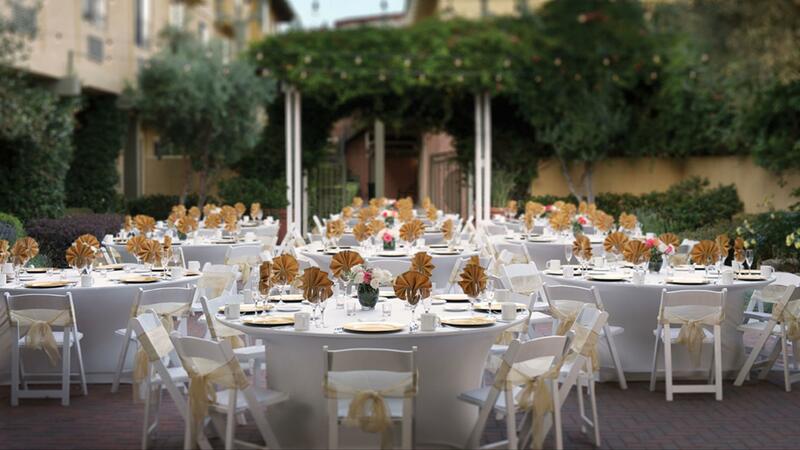 ft. of indoor and outdoor event space, a complimentary 24-hour business center and dedicated event staff, our Campbell hotel is the ideal venue for a spectacular wedding or conference.